Across the world, the diamond is revered as most valuable and beautiful. These exquisite gems sparkle and shine brightly and encourage us to do the same. 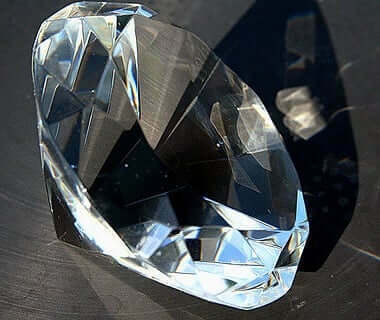 The lustrous diamond inspires great journeys for both our physical selves and our souls, urging us to achieve higher understanding and enlightenment. Our path through life features many facets and detours, which is symbolized in the many angles and signs of diamonds. From an alchemists perspective, the diamond gemstone is one of the necessary building blocks of life. It is made from carbon, which is a base element of most matter. Diamonds are very useful stones in alchemy and spirituality, as they reflect light. People call upon the stone spiritually to become aware of the nature of life, with all of our choices and actions being reflected in the reality that we create for ourselves. Thus, reflection is a major theme associated with diamonds. Additionally, diamonds are also highly symbolic of vision and clarity, assisting us in seeing the road ahead of us in a wiser and more attuned manner. Embracing our individual journeys is important for our spiritual growth, but practicing active awareness throughout the process is crucial. By adopting and integrating the attributes of the diamond into our every day lives, we can move along our unique paths with grace and foresight. Alchemists practiced based on the belief that diamonds would bend and refract light toward them, assisting them in all of their doings. As such, the diamond symbol was particularly indicative of the journey that the practitioner makes throughout his/her work. On this long journey, our souls learn and evolve through the process of trying to achieve higher understanding – the ultimate goal. The path will not always be easy. It is a labyrinth with many twists and turns, just like the many angles of diamonds. It is believed that once one has achieved this state of mind, he/she will have a cleansed soul and a clarified view. This will enable them to manipulate light themselves and serve the outer world with grace. By traveling the path with an honorable heart, you can awaken your awareness and become in tune with the reflective nature of life. To reiterate, the ultimate goal for all of mankind is to follow a path on which our spirits can glisten and dazzle as diamonds do. The diamond symbolism also has particular meanings in Native American beliefs. On the most basic level, its unique shape is considered to symbolize protection in the form of wind. The sharp angles that make up the diamond symbolically guarded individuals and the tribe from harm. Diamonds are made up of angles that create a multitude of facets, each symbolizing a different life perspective: freedom, unity, equality, and eternity. Each of these phases of life is a learning experience that the Native Americans valued. Additionally, it is representative of the butterfly, which is symbolic of the process of transformation and metamorphosis, as well as immortality. These processes were considered crucial for proper growth and spiritual development and would allow you to live your life in a meaningful way. Native American people were highly spiritual, making this gem extremely important, albeit rare, to them. For alchemists, though, the diamond is the true symbol of the elements: air, water, fire, and earth. In this realm, alchemists must skillfully and properly employ all of these elements in order to journey towards creative divinity and achieve enlightenment. One of the major alchemy symbols is the diamond created by combining triangles, each representing an element. They are the building blocks of all matter and all of life. When put together, they form the aether, or the achievement of complete unity and balance. This symbol also reflects the nature of creation, which always occurs in the most simple way possible. For us, this means that when we take the path of least resistance, we are allowing ourselves to fulfill our own unique purposes.